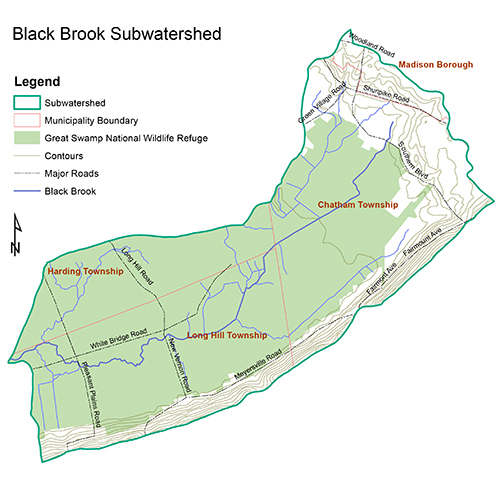 The Black Brook subwatershed covers 14 square miles. Black Brook has numerous tributaries which join together within the Great Swamp National Wildlife Refuge, thus making it difficult to pinpoint its actual “beginning,” but it does have a number of identifiable tributaries outside the Refuge. The tributary at the most western edge of the subwatershed begins in a wet, wooded area to the west of Green Village Road, adjacent to Morris County Park land that is currently open space. Another begins in the Hickory Tree area proper, and is channeled through storm drains behind the Chatham Apartments on Green Village Road. The third tributary arises on Chatham Township municipal property just to the south of the intersection of Candlewood Drive and Shunpike in Madison. The fourth tributary arises within the Fairmount Country Club, where it crosses Southern Boulevard to the east of the Noe Pond Club and then flows southward into the Refuge. The fifth tributary runs parallel to the west of Fairmount Avenue on the eastern edge of the Great Swamp watershed. Nearly 90% of Black Brook is located within the refuge, and it joins the Passaic River just beyond the Raptor Trust on White Bridge Road. Black Brook runs northeast to southwest, with two definitive hydrologic borders; the ridge known as the Third Watchung in Long Hill Township and the terminal moraine of the Wisconsin Glacier that makes up the southwest portion of Madison Borough. Its northwestern and southwestern borders are located in the very low-lying, level areas of the Great Swamp National Wildlife Refuge and are hardly noticeable. Black Brook is second only to Loantaka in terms of poor water quality. It rates poor or very poor in five out of ten water quality standards in the 2015 Great Swamp Watershed Water Quality Report Card. Nutrient levels, such as phosphorus and nitrogen, are high (poor/very poor respectively) impacting the macroinvertebrate HGMI (High Gradient Macroinvertebrate Index) rating which is very poor. Road salt is also elevated in the sections of stream outside the refuge in the winter months. This is likely due to the intense amount of development in the headwaters area. Chemical fertilizers and other contaminates, are carried by runoff from lawns and the golf course into the stream basin. In the areas outside the refuge, the stream bed has been altered and straightened in many places to allow for roads and further development. This altering of the natural course of the brook causes water to move through the area faster, increasing erosion and impacting aquatic habitat. Acetate (which is also pet friendly).